As I suggested in yesterday’s yen to dollar chart, I believe we are seeing the start of a short term rally from the sideways consolidation of the lats few weeks, with the pair likely to start testing resistance above at $93.50 and beyond. With all three moving averages providing support, this is adding weight to the move and I would therefore suggest small long positions for today with a stop loss below the $89.50 region. The Japanese Yen completed yesterday’s trading session with mixed results versus the other major currencies. The JPY was broadly unchanged versus the EUR yesterday and closed its trading session at around the 116.00 level. 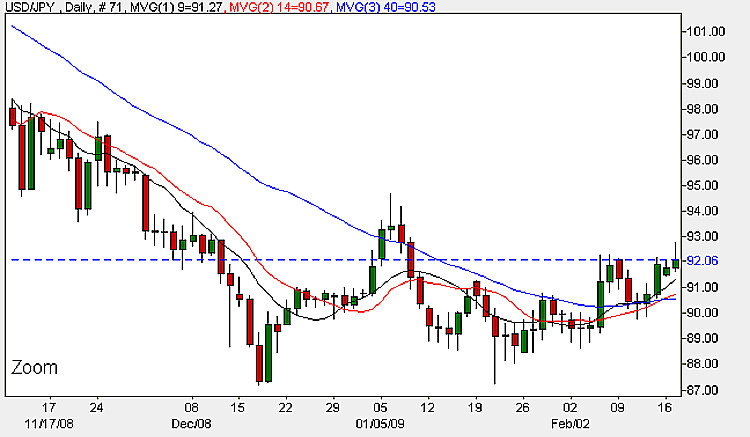 The JPY also saw bullishness against the GBP as it jumped around 100 points and closed at 129.20. Japan’s wholesale inflation dropped for the first time in more than five years as the global recession lowered the cost of oil and commodities. Falling commodity prices and weakening demand for goods kept many firms from hiking prices and even led some to make cuts. The significant fundamental news is due out shortly with the TIC ( Treasury International Capital) figures which represent the difference in value between foreign long-term securities purchased by US citizens and US long-term securities purchased by foreigners during the reported period, and you might well ask why these numbers are important! The simple explanation is that this data represents the balance of domestic and foreign investment – let me give an example which I hope will clarify the situation. If foreigners purchased $100 billion in US stocks and bonds, and the US purchased $30 billion in foreign stocks and bonds,then the net reading would be 70.0B. The market impact tends to be significant but this does vary from month to month. The forecast this time is for +20.0B against a previous of -21.7B. If the numbers are better than forecast then this is generally good for the home currency – the US dollar.